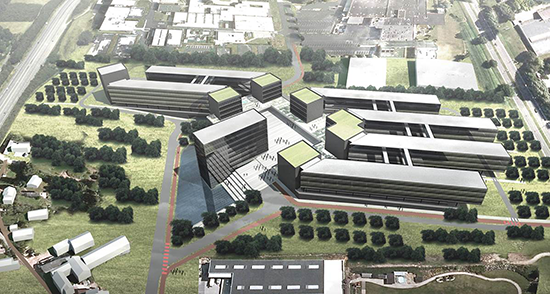 SPRL Juxing International Technology Investment Belgium has decided to invest in the Louvain-la-Neuve Science Park to build the first Chinese incubator complex in Europe, the China-Belgium Technology Center (CBTC). In close cooperation with UCL, IBW and AWEX, work is scheduled to begin in June or early August 2015. In April 2015, UCL granted a long lease to CBTC which was needed for the construction of the 90,000 m2 of building on an 8.3 hectare plot between the N4 and the E411 motorway. In this Chinese centre, the installation of five incubators will allow the development of companies specialising in high technology and in sectors such as bio and nanotechnology, computing and telecommunications, optoelectronics (interaction of optical and electronic phenomena) and sustainable development. This will affect, in terms of an investment of 200 million euros and two years of construction, some 1,500 jobs, including 60% for Belgians. A 160-bedroom hotel is included, as well as offices and local shopping facilities and three separate housing sites in Louvain-la-Neuve for 300 Chinese. A seventh Walloon science park joins the SPoW network!